The beloved odd PI pair Hap Collins and Leonard Pine help a grandmother find her missing granddaughter.The story starts simply enough when Hap, a former '60s activist and self-proclaimed white trash rebel, and Leonard, a tough, black, gay Vietnam vet and Republican with an addiction to Dr. Pepper, are working a freelance surveillance job in East Texas. The uneventful stakeout is coming to an end when the pair witness a man abusing his dog. Leonard takes matters into his own fists, and now the bruised dog abuser wants to press charges.One week later, a woman named Lilly Buckner drops by their new PI office with a proposition: find her missing granddaughter, or she'll turn in a video of Leonard beating the dog abuser. The pair agrees to take on the cold case and soon discover that the used car dealership where her granddaughter worked is actually a front for a prostitution ring. 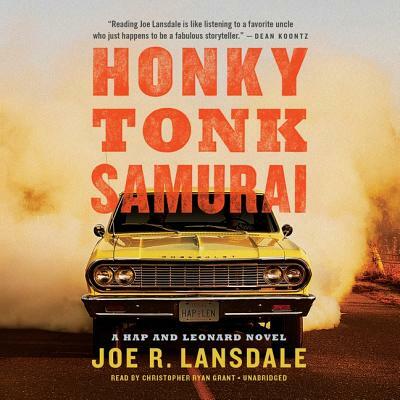 The mystery of her disappearance only deepens from there.Filled with Lansdale's trademark whip-smart dialogue, relentless pacing, and unorthodox characters, Honky Tonk Samurai is a rambunctious thrill ride by one hell of a writer.